Want to know how to solve the F2L of the Rubik's Cube easily? Can't figure out how the pieces move around the cube? Hate memorizing algs? You've come to the right place. This is your source for "F2L made easy"
Concept: You have the bunny ears’ story for tying shoelaces. Similarly you now have ‘RiDo’s Hunting Story’ for building your F2Ls easily. Teach yourself intuitive F2L in 30 mins flat! An enormous amount of solo effort has gone into content research and video production. I'd appreciate if you visit the FB page. For PLL pattern recognition (advanced last layer thing) visit this page. P.S. Keeping our younger audiences in mind, cartoonish animal characters are selected instead of real hunting footages. Here’s a little tool that will be helpful when you learn the PLLs. Unique patterns, that are needed to identify the permutation, have been marked alongside the respective perm and algorithm. Ever wondered how speed cubers quickly recognize which (out of 21) perm to execute? They do not imagine those scary red and blue arrows on yellow squares (that show how the pieces move). Nobody does! They recognize patterns that are made after the completion of the OLL step. So patterns are basically … well, watch badmephisto’s pll recognition video and you’ll come to know what I’m talking about. I have only sketched what badmephisto has taught in the video. So this tool can be thought of as a printable version of that video. Shown in the sample image below are headlights and 2-pair blocks. Benefits of excel over jpeg? ... Easy Customization! You can endlessly customise it without the worry of photoshop layers. - Rotate the images as you like. - Edit recognition patterns the way you personally recognize them. A member (oll+phase+sync) suggested that you can even mark an arrow for the way a block/layer starts moving, depending on which alg you favour. 1. Large diagrams where you can write your own notes - 3 page print. 1. G perm not working? Just did a G perm and still left with a U perm? Well, it was an A perm to begin with. It happens when you are new and hasty. Look behind the headlights too. You'll find a 3 block! You must visit his pll page to learn how to execute the pll algs. He has explained it nicely. And don’t worry, it’s not a crime to refer to such sheets. Many cubers mark these headlights/patterns on the standard pll figures, with marker pens, when they learn. So it’s nothing new. So you’ve been learning the F2L and are getting comfortable with it? Solving the cube in approximately 25-50 seconds? Very good! Now there are numerous things to do if you want to drastically reduce your solve times. • Solving the cross on the bottom (Practice blindfolded crosses). This leads to better look ahead into F2L. 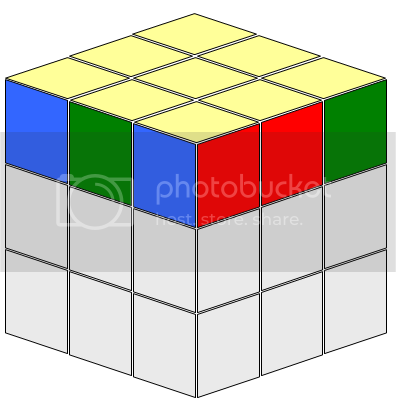 • Intuitively knowing all cases of the F2L from various locations on the cube, and making full use of both the hands. But arguably the most important aspect to gain quick times is (drum roll please) Look ahead! I will try to break this down for you and hopefully you will understand it. There is also a sample video in the end of the post. Before we start it is necessary that you are comfortable with all F2L cases. You should be able to spot a case, close your eyes, and solve that case. If not, then do not read this guide right now. Come back later when you are comfortable. So a race car is approaching a corner and needs to take a turn. The driver will slow down and adjust his car before a turn, as he knows that the next turn is a right or left hander. In cubing you don’t really know (yet) what the next turn is. Let’s say you, the cuber, are the driver. In cubing terms, if you are not looking ahead, you are basically approaching the corner at full speed, screeching to a halt at the corner, assessing the road, left or right, adjusting the car and starting to speed away. Great loss ain’t it? Reaching the corner quickly isn’t important. Getting out of there quickly is! So if you know racing, there is a braking point. You carry maximum speed into the corner, hit the apex and have a great exit for the next straight. Optimum racing line! Each F2L case is a straight road. The gap between two F2L cases is a turn in the road. You need to slow down before taking the turn and get out seamlessly. Makes sense? So in F2L what is my braking point and how do I assess my next turn? For starters, (exercise sake) your braking point is the point where you insert the current F2L pair in its slot. So if you have 3 simple moves left (an R U’ R’ for example) that inserts the F2L pair in its place, hold it right there! Do not insert it. Just pause the whole world. Keep the cube down if you want. Take a deep breath. Don’t be in a hurry…… Now, scan for the next possible F2L case. Once you roughly know the next case, insert the current F2L pair in its place and seamlessly, without the slightest pause (very important), start the moves for the next F2L pair that you just spotted. You have just learnt to drive on the optimum racing line! I know, there is a gap after all! But a gap before a known step is better than a gap before an unknown step. This new gap is easy to eliminate as you already know what to do. So while your hands will continue moving, your mind and eyes will start assessing the next turn eventually. You do not have to work at bringing this new gap down! It will come down on its own. This is the reason why I told earlier that you should be able to solve the F2L cases blindfolded. Just consciously work on "not keeping a gap between two F2Ls." I cannot stress enough how important this is. Over time, you can adjust your braking point over the entire step of the current F2L pair. Slowly you will find that you do not need to brake. You just need to slow down a little. Train yourself to achieve this. Well, initially you can achieve this easily by cheating. Simply slow down your hands! If you find that your hands are moving fast and your brain does not know the next F2L case, you are basically going into the ‘screeching halt at the corner’ mode. Consider this as a big crime and punish yourself if you want. Avoid this at all costs. Hand speed is something that will come naturally once your mind is the governor. Don’t let your hands be the governor. Having said that, finger tricks while F2L are important. You must work on that separately. Knowing the probable locations of solved and unsolved pieces. 1. If you cut down your cube rotations, you can remember which slots are solved and which are unsolved. Like memory locations inside a RAM. Mentally tick-mark the solved slots. Only 4 to remember. So easy! Use these free slots for solving cases. Combining the above two ideas, you will be able to zero down on the probable locations of the next pieces. An average Fridrich solve takes 60 moves. To solve it in 30 sec you just need to do a mere 2 turns per second! But it gets even better. Based on your practice levels, you can execute the OLLs and PLLs much faster than just 2 or 3 tps! (Sub 1 oll/pll folks are grinning right now) So you can afford to 'waste' more time at the cross and F2L. You can make up for lost time at the OLL/PLL stage! The key to maintaining a constant and slow tps is (you guessed it right) look ahead! Going fast will make matters worse. How much is look ahead and how much is YOU? Take the same scramble and solve it 5-6 times using the same solution. You will, by then, have memorized the solution. Next time when you solve it you will practically not have to ‘look ahead’. You know what is where all the time. So the timing you get after memorizing the solution is what look-ahead can theoretically get you at! For further improvement, work on tps and techniques. Get some good algs. Corner biased: Track/Spot a corner, and then search for its corresponding edge piece. Edge biased: Track/Spot an edge and then search for its parent corner. Here is a discussion on that. In the beginning, being a white cross solver, it may be easy to spot the white corners and be corner biased. But eventually as you improve, you will shift towards being neuteral biased and will track more pieces automatically (or you should work at it and get there). F2L done! Shall I look ahead for OLL/PLL? Ummm…. Nope. Cos you just have to scan one face (or layer if you know full OLL) as opposed to 3D scan while at the F2L stage. So just spam the last f2l, oll and pll conventionally as of now. Later on you can do things like partial edge control. Or even winter variation if you are getting better. I mean really really better. Like playing the air guitar, solve the air cube. Start the timer, and in your mind just imagine each step being solved. Cross, each f2l, oll and pll. Give each step the same amount of time as you would need in real. Not astronomical or Faz-ical times. After the air solve, stop the timer and see the time. Noticed a big difference? All that difference in time is just because in real you waste a lot of time figuring out your next moves. This highlights the fact that the mind is to be trained. Make a video of yourself solving the cube (real cube this time) and see it. You will know which areas you need to work at. Ok this one is just for fun but may be helpful. I have two cubes that are really slow and bad. When sometimes I solve them, it gets locked up and stuff, and all this time my mind gets bored to look at the steps and instead it automatically focuses on the next pieces. So the bad cube is forcing you to actually slow down. Like a speed limiter on a vehicle. When you are slow and use a timer, you generally tend to panic and take more time. This happened to me too. Here is a possible solution for that. Getting good look aheads helps. Many such videos are available online. If you observe carefully you can also see people doing the Cross & F2L at slower tps than OLL PLL. Alright so this post was mainly written to throw some light on 'look ahead'. Hope it helps. There is more to speed cubing than look ahead. As usual, discussions here. I thank the members of the forum for sharing their valuable thoughts towards the refinement of this article. MTech, Ocean engg and Naval Architecture - IIT Kgp. Working as a researcher in a Shipping firm. Started cubing in August 2010.